The notion that a sports team can magically erase the pain and anguish inflicted on Charlottesville by white supremacists minimizes the severity of the trauma. 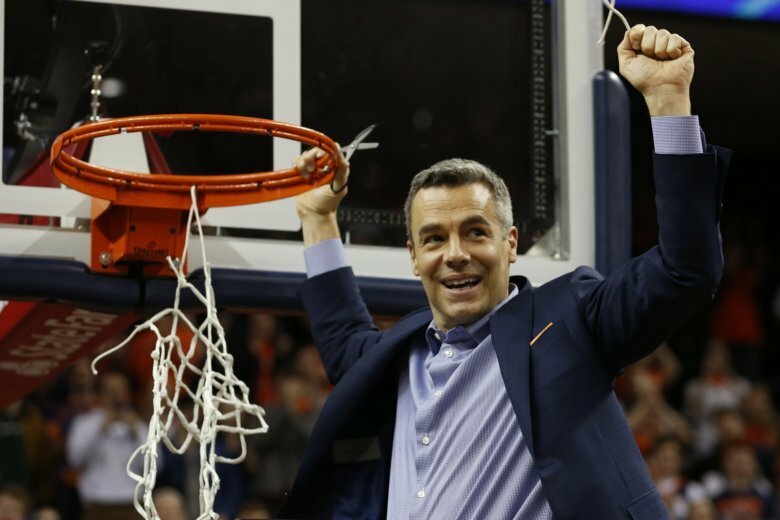 As the gleeful image of Kyle Guy on the digital cover of Sports Illustrated suggests, the University of Virginia’s Men’s Basketball team’s victory at the NCAA tournament on Monday is a story of redemption. The men’s basketball team made history last year when they were the first top-ranked team to be eliminated from the tournament by a number 16 seed, the University of Maryland Baltimore County (UMBC). A few nights ago, they became the first men’s basketball team in our university’s history to win the NCAA championship. The fortitude, skills and resolve this team deployed on their journey to the pinnacle of college hoops belies conventional expectations. Unfortunately, some have seized on this moment to transform these student-athletes’ Herculean victory into a panacea, a pivot and a public relations pitch to erase the trauma of the white supremacist attacks of 2017 that forever marked the University of Virginia and its home, the city of Charlottesville. Such attempts are harmful to our community and to the country. The notion that a sports team can magically erase the pain and anguish inflicted on Charlottesville by white supremacists minimizes the severity of our trauma. It also diminishes the years of work these student-athletes, many of whom my colleagues and I have had in our own classrooms, performed in the service of their athletic goals. They are NCAA champions. They are students who worked diligently in their courses and on the court. They are not hand sanitizer. Their accomplishments should not be used to conveniently expunge traumatic racist history or clean the reputation of this city. It is tempting to believe that the team’s victory is an opportunity for Charlottesville to turn to a fresh page in its history. As UVA politics professor Larry Sabato told The Washington Post, “It’s certainly attracting a great amount of positive attention, which is a nice antidote to the avalanche of negative attention” following the violence of August 11 and August 12, 2017, which he pointed out involved many protesters, most from out of town (while neglecting to mention that two of the main white nationalist organizers were UVA graduates). Even when people try to resist the narrative arc of redemption, some media outlets are so wedded to the tidiness of that story that they have tried to frame commentary to fit. Consider UVA media studies professor Siva Vaidhyanathan’s interview on PBS NewsHour following the big win. When asked if the victory represented a new story for Charlottesville, Vaidhyanathan was rightly explicit: “I think this victory will be among the great moments in Charlottesville history as we look back, but it will not — it will not wipe out the tremendous pain, the tremendous violence that has built Charlottesville, that has built Virginia, that has built the United States of America, right?” Yet the interview was titled “How the ‘Hoos of Charlottesville Could Help Heal Their City.”An interview title may seem like a small thing to most, but for those of us who live in Charlottesville, it’s a false narrative about many of our lives. To be sure, Charlottesville and those who love the University of Virginia have a great reason to celebrate. These student-athletes overcame an unprecedentedly brutal 2018 tournament loss with focus, determination and poise in 2019. This is a remarkable feat that illustrates grace under pressure. What it is not is a reset button on history. It is not an excuse to resurrect the dangerous illusion of an idealized civil Charlottesville. Rather than project a savior narrative onto the UVA men’s basketball team, we could take a much humbler approach and try to learn from their recent accomplishments. We could accept that though the team has labored to reach the pinnacle of success following a hard loss, Charlottesville has yet to ascend those heights. One lesson we might wish to adopt from the team is that hard work is a key ingredient of redemption. It is not given; it is earned. Instead of redemption, it seems that those who would frame these students’ achievement this way are actually seeking what pastor and theologian Dietrich Bonhoeffer called “cheap grace” — which he defined as “the grace we bestow on ourselves. Cheap grace is the preaching of forgiveness without requiring repentance […]” In this context, cheap grace is claiming a team’s victory as a municipal accomplishment that redeems a traumatic past without regret, repentance, remorse or even acknowledgement of harm. It is unfair to take these student athletes’ hard earned redemption on the basketball court and use it for Charlottesville’s cheap grace. Charlottesville would be better served to follow the lead of its mayor, Nikuyah Walker, whose campaign slogan was “Unmasking The Illusion.” She implored the community to remember rather than forget. Once we do the difficult work the mayor describes, Charlottesville will have a redemption story it can fully claim.